Do you dread the Fourth of July for fear of how your pet will react to loud noises and bright lights? Many people can attest to having their dogs and cats go bonkers while fireworks are going off, and then having to deal with the “damage” afterwards. In addition to having a scared or injured dog or ruined furniture and broken windows, there are other, less obvious hazards to watch out for this July 4th. 1. Keep them away from the noise. This is probably the most important thing you can do for your pet. The best idea is to keep them indoors in a familiar and safe place. Close all doors and windows to reduce noise. Consider even turning on music or television to keep things feeling normal to them. Don’t bring them to festivals where there will be lots of other people and fireworks going on. This will also prevent them from running away or getting lost. Fact: Did you know that after the 4th of July, there is a 30% increase in lost pets? That’s scary! Do what you can to prevent losing yours! 2. Don’t let them near fireworks You may get a great YouTube video, but the risk is not worth it. Not only can your pet become burned or otherwise injured by getting too close to the fireworks, they can also suffer serious internal damage from eating them. If you do decide to let your dog outside while letting off fireworks, it is advisable to keep them on a leash and far away from where the fireworks are being stored and let off. 3. Keep them away from other pets. This is especially true if you will be celebrating with other people who will have their pets around. Fireworks can make your dog on edge and be more prone to getting in fights with other dogs. This can result in injury or even death for your dog. 4. Keep non-pet items out of reach! This includes alcohol, lighter fluid and matches, oils, and anything else that could be hazardous if ingested. Many animals are poisoned or injured from ingesting chemicals. 5. Don’t use non-animal approved items on your pet. Many people like to dress their pets up on holidays. This can be fun and safe! However, don’t put items on them such as glow sticks which could be harmful to their health if ingested. Likewise, don’t put substances which are safe for human use, such as sunscreen, on pets. This is because they could lick and groom themselves and ingest the substance. This is not good for your pet! 6. Don’t give your pet human food! Just because you are eating barbecued hot dogs and s’mores doesn’t mean your pet should! It can be tempting to “celebrate” with your pet by allowing them to eat unhealthy human food. But this is just plain unhealthy for pets and could cause bigger health problems for them. 7. Consider using anti-anxiety medication. If you know that your pet is one of those who becomes terrified with 4th of July fireworks, it might be a good idea to plan on giving him some anti-anxiety medication to help him get through it. 8. Act normal! Signs that your pet is feeling anxious and scared include them howling, shaking, running around frantically, and trying to hide. If your pet is obviously having a hard time, remember to act normal around them. Show them you aren’t scared by petting them, talking soothingly to them, etc. If they see you acting normal and unafraid, it will help them to calm down. 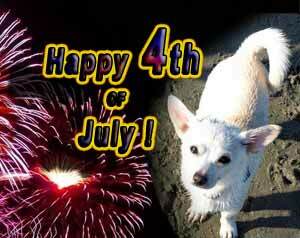 What are some experiences and tips you have to share on keeping your pet safe and healthy this 4th of July?